SIMPLE COOKIES MADE WITH LOVE AND KISSES OF CINNAMON. Who doesn’t love the taste and smell of cinnamon? Every time I walk through a mall with a Cinnabon shop where they make the most delicious smelling cinnamon buns I get weak at the knees. These soft cinnamon cookies are low-carb and perfect as breakfast cookies with a hot beverage or a snack throughout the day. Best of all they are sugar-free. 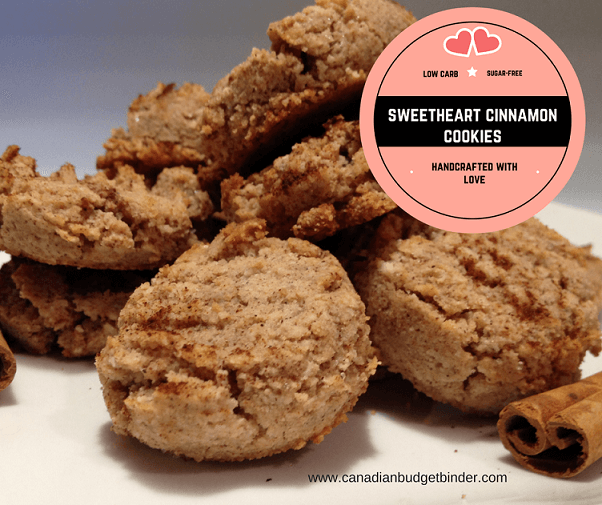 If you or someone you know enjoys a low-carb high-fat lifestyle these Sweetheart Cinnamon Cookies make the best homemade gifts. With Valentine’s Day in the next few days go ahead and spread some low carb love and bake up a batch even if they are for yourself. This recipe for soft cinnamon cookies use both almond flour and coconut flour for texture and flavour purposes. Both the almond and coconut are a low carb flour and used in many dishes along with lupin flour. Lupin flour is produced by drying and grinding the lupin bean. You may also know these as lupini beans (rubbery outside skin) you can buy in cans at the grocery store in the International aisle. We have yet to try lupin flour but may just look around to see where we can buy it in Ontario. 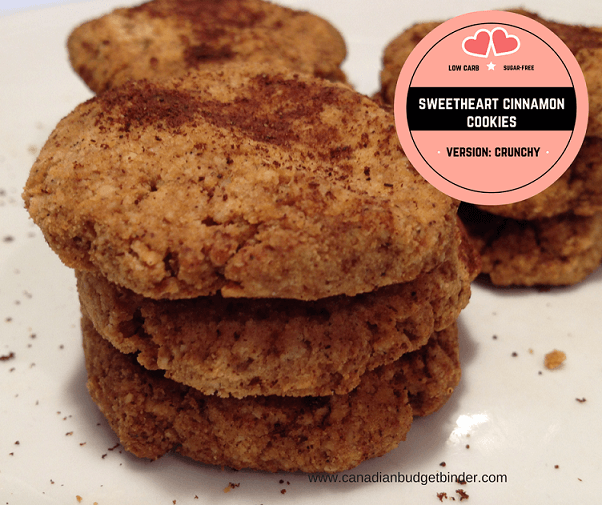 I tested this recipe using two different baking methods and times as I wanted to see if I could take these soft cinnamon cookies and turn them into crunchy cinnamon cookies without burning them. What I ended up with was exactly what I was hoping for and more although making anything crunchy that is low carb I’ve learned has to be baked low and slow. Just the other day I made a batch of double chocolate biscotti cookies with avocado and boy did they turn out nice. I’m not a low carb eater but I do test what we make and I can see why certain recipes are very appealing and others not so much. For soft sweetheart cinnamon cookies bake as directed below. I personally like the soft cinnamon cookies but Mrs. CBB says she sometimes craves crunch so either will do for her. This is a very common question for anyone who is starting out eating low carb. Are there carbohydrates in cinnamon? Yes there are carbs in cinnamon as do many spices so it’s important if you are on a low-carb high-fat diet such as Atkins that you include every ingredients when tallying up your net carbs. You’ll find this is a simple low carb cookie recipe that doesn’t take long at all to make. You can enjoy them fresh after they have cooled or they are even great right from the freezer. We often find that after a day or so the cookies have a stronger flavour as they’ve had time to rest. 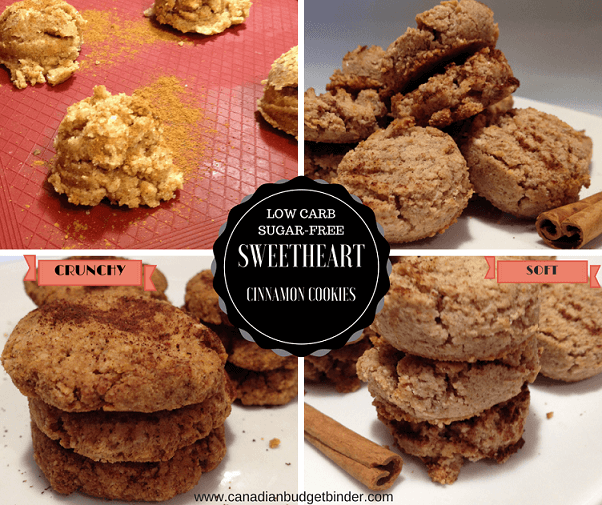 Low carb cookies such as these soft sweetheart cinnamon cookies are perfect for snacks, breakfast cookies or holidays. Scoop balls with melon ball scoop and place on silpat lined baking sheet and bake for 5 minutes at 300 degrees. Take the baking pan out from the oven and using a fork press down on the top of each cookie to make a fork indent. There really is no reason to make low carb baking complicated especially when you are working with some of the best ingredients around. 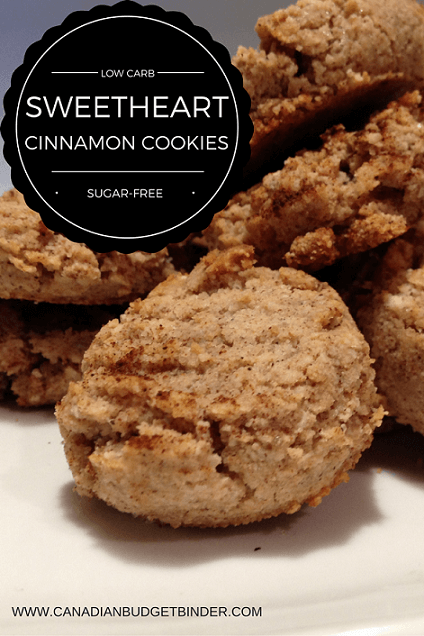 Enjoy your Soft Sweetheart Cinnamon Cookies with a cup of coffee, tea or dunk them in milk. Have you tried any of the low carb flours I’ve discussed in this post today? Hello. cookies! You look yummy and delicious. I will really enjoy biting these sweet treats.